Butter 8x8 dish and cover bottom with banana slices. 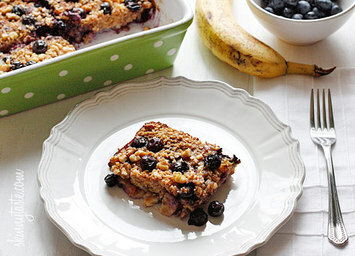 Then sprinkle 3/4 cup blueberries over top bananas and set aside. In medium bowl, mix together oats, baking powder, cinnamon and salt. Stir to combine. In another bowl, beat together milk, egg, butter, vanilla extract and maple syrup. Add oats to dish and gently pour milk mixture over oats. Gently rap pan on the counter to make sure the milk has gone all the way through the oats. Sprinkle the top with blueberries and cook in oven for 35 to 45 minutes until the top is golden brown and the oatmeal is set. If desired, drizzle the top with more maple syrup.